Q. How many vegetarians does it take to shingle a roof? A. Three, if you slice them thin enough. Last June, Abby saw a lavish propane grill on sale at Home Depot and brought it home to me as a surprise. At first I wondered why, since we’ve never been grillers, and, as my faithful readers know, I have been a vegetarian since 1989. What, I also wondered, were we going to cook on it? Within a week, though, that all changed, since Abby loves vegetables as much as I do. 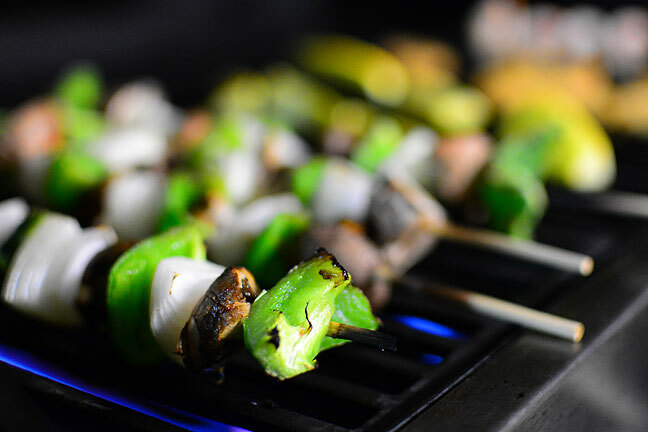 We’ve grilled all kinds of vegetables, from yellow squash to portobello mushrooms, and everything in between. We used it all summer, and while we talked about using it all year long, there was a period this fall when we kind of forgot about it. Ten days ago at Wal-Mart though, I got an assortment of vegetables for both of us, and some frozen shrimp for her. As soon as I fired up the grill again, I was flooded with a wave of nostalgia for those great flavors and the great times we had all summer. And we had another wonderful meal together, then another last week. I might even cook portions of our Thanksgiving dinner on it Thursday. Cooking out in the fall and winter means cooking by the light from the garage, and sometimes in the cold, which I actually like. Since it was dark out when I made this image, you can see the blue flame from the propane.